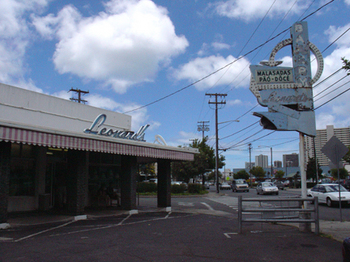 Ask anyone about Leonard's Bakery and I bet the first thing they would mention is the malasadas. Leonard's Bakery has been doing business since 1952 at the same spot on the corner of Kapahulu Avenue and Charles Street. Well, what exactly is a malasada? 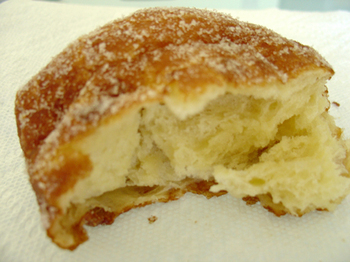 Malasadas have their origins in Portuguese cuisine and are a sort of fried pastry dough. Malasadas from Leonard's are exactly that. Dough that has been fried until crispy and golden brown on the outside, while remaining fluffy and moist on the inside. 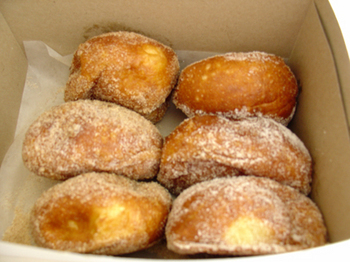 Here at Leonard's you can get your malasada fix 2 ways, either with sugar or with sugar/cinnamon! At a measly 66 cents each, I get 3 of each to go! Incredibly delicious, they should be eaten while still hot for the best sensory overload around! Here's a recipe for malasadas made the easy way. Blend the first 5 ingredients together until smooth and lump free. Set aside. This mixture should be almost the same consistency as pancake batter or a little thicker. Take 5 slices white bread and remove the crusts and cut each slice of bread into 4 squares. Then, dip the bread into the batter and drop into hot oil, frying until golden brown. Remove from oil and then place in paper bag filled with sugar. Shake to coat. I can't stand it. More Death-to-low-carb-diet delectables. I could eat the whole box right now. Although I could probably eat all six by myself, and in one sitting, I did not! =) You could try to make the recipe I listed to get the effect of what it actually tastes like. After this is cooked, you wouldn't be able to even tell that it was bread! I sure wanted to eat the whole box, but unfortunately for me (or should I say fortunately?? ), I didn't! How lucky for you that you aren't able to gain any weight! As for me, I can feel the pounds coming on as soon as I even look at food! =) And let me tell you...I love to eat! Another quick malasada recipe (this is super fast, yet super cheating) is to get a can of Pillsbury biscuits and deep fry each piece individually. As soon as they come out of the fryer, roll in sugar. Voila! I know, it's not the same, and there is that strange aftertaste that just comes from anything frozen. But in a pinch, they're real good, esp. on the mainland where there's a huge lack of malasada joints. Thanks for dropping by. They are very yummy and because they are so light, you can easily eat a lot of them without realizing it! Does it also come out light and fluffy? Normally, the biscuits are a bit dough-y right? I only use the recipe above because I learned it years ago...I think I was in the 4th grade! You can't even tell that there's bread in the middle once it's been cooked. hoolauleia on Sep 17th at Lorenzo Park and the weekend after that, San Diego having theirs at the Mission Park. Bring someone to cook!!! Thanks for stopping by. I would cook myself if I could stay in Vegas long enough. I'll be there for Labor Day weekend and then I'm gone. I'll let the folks over at Leonard's know that they need to open up an outpost on the mainland. How's about a Leonard's Junior truck parked outside the Cal? Don't forget the hoolauleia on the last weekend of September in California, Mission Park!!! Welcome to the site! I would love to go to the Ho'olaulea, but I'll be very busy at work. Just got back after a week away and I was so missing all of the food here. Thanks for stopping by! Aloha!!! How's it going everyone at Leonards Bakery. You guys make the best malasadas in the islands. I miss Hawaii and your wonderful malasadas. I'm stationed way down on the east coast at Pope Air Force Base. My wife and I have been making a whole bunch of malasadas for ourselves and the other local Hawaiians up here. We've probably tried about 3 or 4 different recipes and no one can match your's. It's alright if you have to protect your secret, but we were wondering whats the secret to making the malasadas light and fluffy. There's about a half a dozen of us up here, and thats not even including all the people from Hawaii in the army at Fort Bragg. We sure do miss your malasadas. Well thanks for all the great memories. Thanks Leonards Bakery. Thanks for dropping by. I'm not sure that I can speak on behalf of Leonard's, but if anyone has a secret, I'd like to know as well. Where are you from originally? Leonard's malasadas are the best, hands down. I found this many years back on a website while watching a show on TV. Don't know if this is authentic but you can try it. > dough. Cover and let rise until doubled. Heat deep fat to 350 degrees. > then shake in a bag with sugar. Thanks for the recipe. I'm sure that everyone here will enjoy it. I'm going to try this sometime and I'll let you know how it turns out. I'm glad to see you found some malasadas in San Diego. I'll be sure to check it out next time I'm in the area. I think Champion also makes haupia malasadas, but I can't be certain. Maybe I should pay them a visit. when i was little i used to get birthday cake from there every year,Da Bes buttercream frosting eva!gotta send da recipe.Now i tutu and da picture of the bakery still looks da same.I always tell my kids that they have never had a birthday cake till you had leonards.Next time i go home i'm going to buy me a cake just to remember old times. I must stop by and take a photo of it sometime. Thanks for sharing your memories with us. I hope to hear from you again! I JUST WANTED TO SAY THAT THIS IS THE FIRST PLACE I WENT WHEN I WAS ON VACATION IN HAWAII. WE NOW LIVE IN VEGAS AND IT AIN'T FUNNY WHEN YOU NO MO THE HAWAIIAN KINE FAVORITES. GOSH YOU FOLKS SHOULD START THINKING ABOUT OPENING ONE IN VEGAS? WE ALREADY HAVE THE ISLAND STYLE FAVORITE RESTUARANT CALLED L&L'S. Unfortunately, I have no affiliation with Leonard's Bakery, but perhaps you can send them a note at the adress I've provided. As for the SD = Portuguese connection, I had no idea about that. Perhaps the reason for not making malasadas more often is because no one orders them? Do the people there watch their weight? Hehe! You know we don't right?